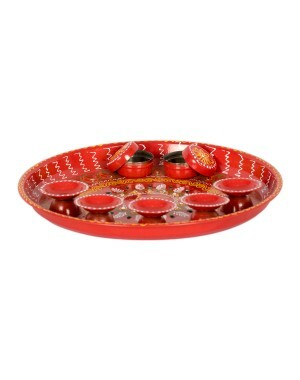 Unique appeal of traditional feel, Suitable for daily pooja & religious functions. Size of the product: 2.5" (L) x 25" (W). Aarti dish is one of the most important items during a pooja. The oil painting on the dish makes it a stand apart from other aarti dishes. There are three holders for diyas and two boxes for storing holy ash and vermilion. Decorated with beautiful rangoli in the center increases the traditional quotient. Highly skilled artisans work painstakingly and lovingly on each piece preserving its uniqueness and beauty to make it everlasting. Be it a Personalized gift or a Wedding Gift.